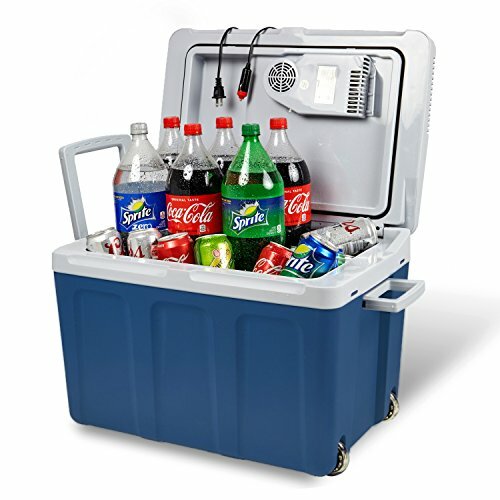 While standard coolers can prove useful for keeping beverages and food cool on family outings and at outdoor events, they aren’t made to do it for long periods of time. You can benefit from cold lemonade within hours of putting it in the cooler, but before long, you’ll be sipping a warm beverage after the ice packs keeping it cool have reached room temperature. It might seem like there’s no way to combat such a problem, as ice is going to melt regardless. However, there is a better way. Portable electric cooler is taking the market by storm, providing campers and outdoor enthusiasts with the opportunity to keep their food and drinks cold for as long as you require. In fact, most will even offer heat as well, should you need to keep dinner warm. There are several different portable electric coolers for sale, such as those that run on AC or DC power, and even those that run on batteries. Whichever option you choose, one thing’s for sure; you’re going to benefit from an ice-cold drink on a boiling hot day. We’ve included nine of the best portable electric coolers below to help you make an informed purchasing decision. 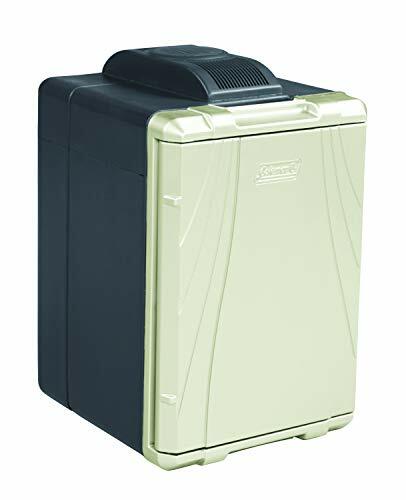 This Knox Gear portable electric cooler is a favorite with consumers for many reasons. Not only does it chill your food and beverages to 40-degrees Fahrenheit below the outside temperature, but it can also heat them to 130 degrees if you so desire. Whether you’re parked up at a lake for a picnic, or you’re camping, you’re sure to appreciate the convenience on offer from this portable electric cooler. It features plenty of space for both food and beverages and is easy to transport with a locking handle, wheels, and a carry handle. 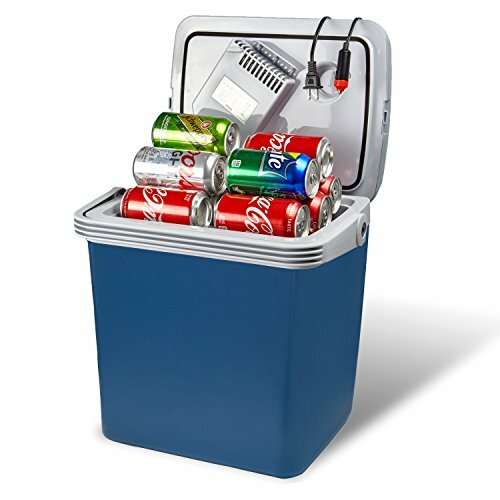 This cooler can also be used with an AC home plug or a DC car plug for when you’re out and about. 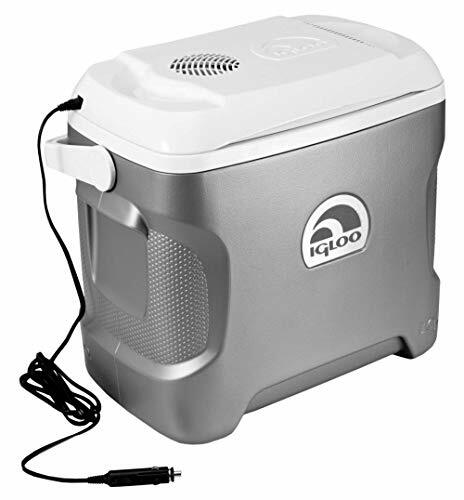 Camping and outdoor adventures have never been easier than with a Koolatron cooler. This cooler, made from high-quality polypropylene, can cool or warm your food and beverages to your desired temperature. It can sit either horizontally or vertically, has a removable shelf, and enables you to organize the contents as you would in a standard fridge. The user can benefit from so much convenience! Benefit from an ice-cold drink at 40F below the outside temperature, or a piping hot coffee at 135F. Whatever you require, this cooler is sure to handle it. In fact, you can even take it to a party as it’s capable of holding 56 12-ounce cans! 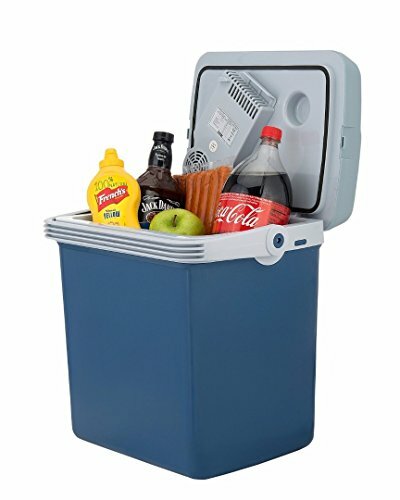 This cooler is the epitome of versatility as it offers several different power options to heat or cool your food. Unlike most other cumbersome coolers, it’s lightweight and compact and is even suitable for SUVs, small cars, or minivans. It uses 12 volts to keep your items at their desired temperature and can plug into a standard outlet in your home with an AC adapter. This cooler operates quietly in any situation and can heat to 135 degrees F, or cool to 40 degrees F below the outside temperature. There’s nothing quite like not having the stress of ice packs melting, or sipping on warm beverages. One of the biggest problems with standard coolers is how much space is taken up by ice bricks, and ice cubes. To keep your drinks cold, you’re having to sacrifice at least half of the interior space, leaving not much room for your actual food and drink products. Igloo bucks the trend by providing consumers with a thermoelectric cooler, removing the need for ice and cooling bricks. It has an ergonomic design to make it comfortable to carry and offers a brushless motor with convection cooling that circulates cold air, all the while doing it quietly. The power cord is conveniently eight feet in length, and plugs into a 12V DC receptacle such as a cigarette lighter, enabling you to take it with you anywhere on the road. This convenient and portable electric cooler is a must-have for anyone looking to head out on the open road. Camping with friends and family can be a whole lot of fun, especially when it’s in an RV, camper, or minivan. However, knowing how to regulate the temperature of your food and beverages when you’re traveling can be difficult. You can spend endless amounts of money on ice bricks and ice cubes, but within a few hours, they’ve thawed, and your food is at risk. Knox provides a solution with its portable electric cooler. 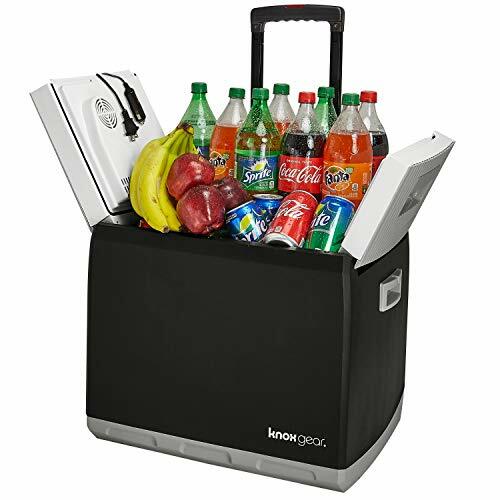 This cooler can be plugged into both vehicles and house power outlets and provides enough storage for 48 cans, or food and snacks. It’s also easy to carry with its ergonomic handle and design and comfortably fits into a car trunk to leave enough room for luggage. It’s clear to see this portable electric cooler will make a great travel companion. Road trips with friends and family, while fun, can be expensive. The huge price tag on such a trip can often be put down to having to eat at takeaway joints and restaurants along the way. You can cut down your travel costs by merely investing in a portable electric cooler, such as those by Wagan. 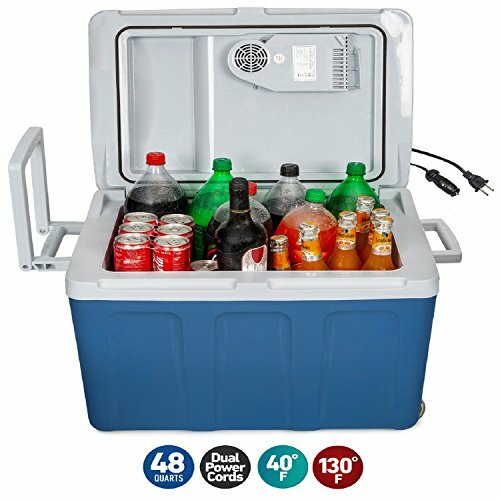 Instead of buying pricey gas station food, you can keep your food and beverages cold (or warm) within a portable electric cooler in your car. There’s no need to worry about ice, and it plugs into your vehicle’s 12v DC outlet with ease. 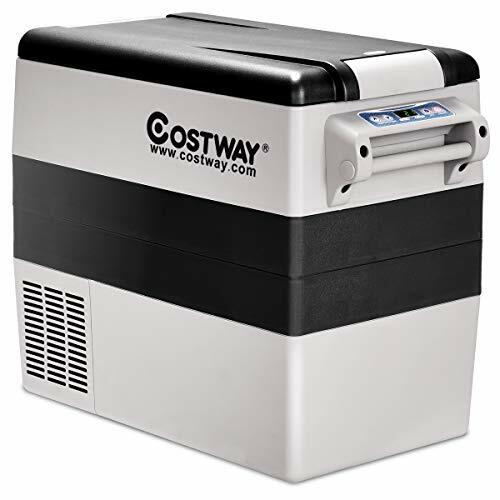 This portable cooler is easy to transport around, is compact, and has a 32-degree cooling capacity and 140-degree heating capacity. It can hold up to 12 cans, or plenty of healthy food and snacks for on the road. Akin to a retro fridge you’d often find in your grandparent’s home, this Cooluli portable electric cooler is a neat find. It sits snugly in the backseat of your car, or the cab of a truck, and even has a six-foot cord to reach the AC or DC power with ease. Operating on thermoelectric energy, it’s perfect for camping, and changes from cooling to heating at the flick of a switch. It’s also compact, can hold 18 12-ounce cans or a range of food, and is versatile for whatever you need. Reap the rewards of also receiving an AC and DC adaptor to further enhance the versatility on offer. Number eight on the list is a compact, functional and exceptionally versatile heater or cooler for all your traveling needs. Whether you’re on a road trip, at a day event, or you’re out camping, you’ll benefit from a cooler that keeps your food and beverages warm or cold – whichever you desire. It can heat up to 140 degrees F, or 36 degrees below ambient temperature. It can hold 27 cans or as many snacks as you need to keep you going. Unlike most cumbersome coolers, this Wagan cooler fits snugly in most vehicles, giving you plenty of space for passengers and luggage. 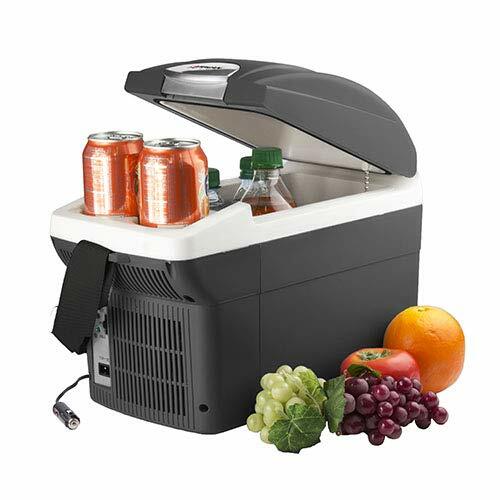 If you find trying to organize and find food within a portable electric cooler difficult, this Wagan cooler in at number nine could be a good option for you. Offering all the standard heating and cooling functions you’ve come to know and love with electric coolers, it also provides convenient compartments to separate items. It also has massive interior space to the equivalent of 60 12-ounce cans and is perfect for families who are out on a picnic or a road trip. It has built-in side handles, folding handles, and wheels, all which contribute to making this cooler as portable as possible. The doors are also magnetic and removable to enable cold or heat to remain sealed inside the 46-quart space. If you’re in need of a cooler with a difference, this Wagan cooler might be just what you’ve been looking for.